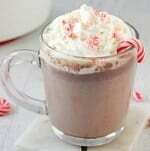 This hot chocolate recipe is a real crowd pleaser, especially dressed up with peppermint. 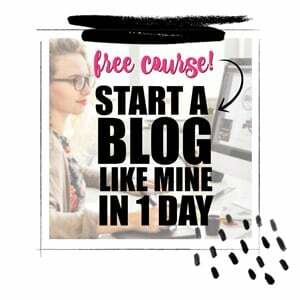 It couldn't be any easier to make either since you bring it together in the crockpot! 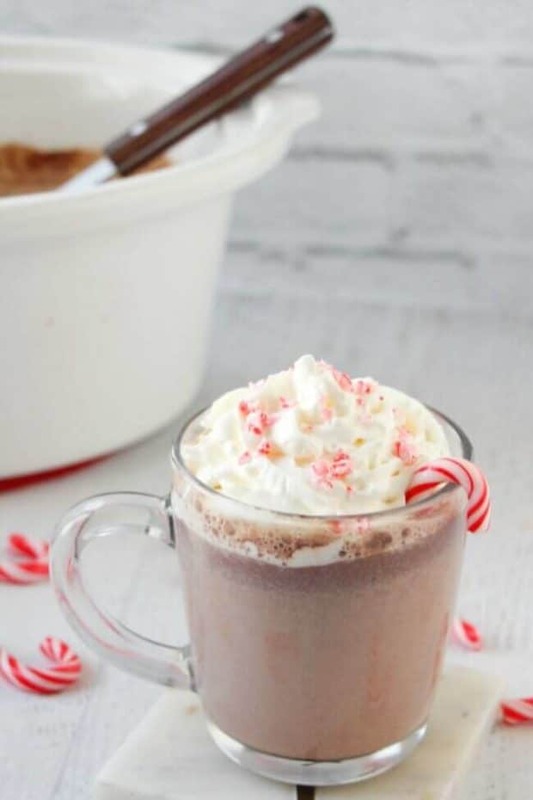 This Crockpot Hot Chocolate with Peppermint is an easy homemade recipe that is creamy and delicious! Hot chocolate is a real crowd pleaser. It’s like your favorite little black dress — always ready for a holiday party. Dress it up with peppermint and it will be a sure hit on your winter beverage bar but this recipe has something else going for it. You’ll love this rich, creamy flavor and how simple this crockpot hot chocolate is to make from scratch. Have you ever noticed how a smell or taste can become associated with an emotion? I’ve never had a bad experience with hot chocolate! It transports me to a place of comfort and joy with all sorts of happy memories. 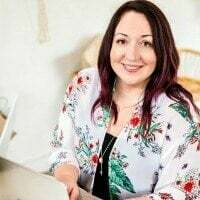 For example, hot cocoa gets partnered with the afterglow of Christmas caroling, sledding, scoping the neighborhood for decoration displays, football game celebrations and Santa’s plate of cookies. All the good memories and happy feels. Not only does hot cocoa provide warm fuzzy intangibles, dark chocolate (my favorite) has possible health benefits—lowering the risk of cardiovascular disease, decreasing blood pressure, increasing insulin sensitivity, and improving mood. I’m not saying hot chocolate is medicinal…but it’s more on my nice instead of naughty list! You’ll be on the nice list too if you make this for those you love this holiday season. So when you’re in a holiday hurry and it’s time to party and you want a festive beverage for the gang, may I suggest hot chocolate? 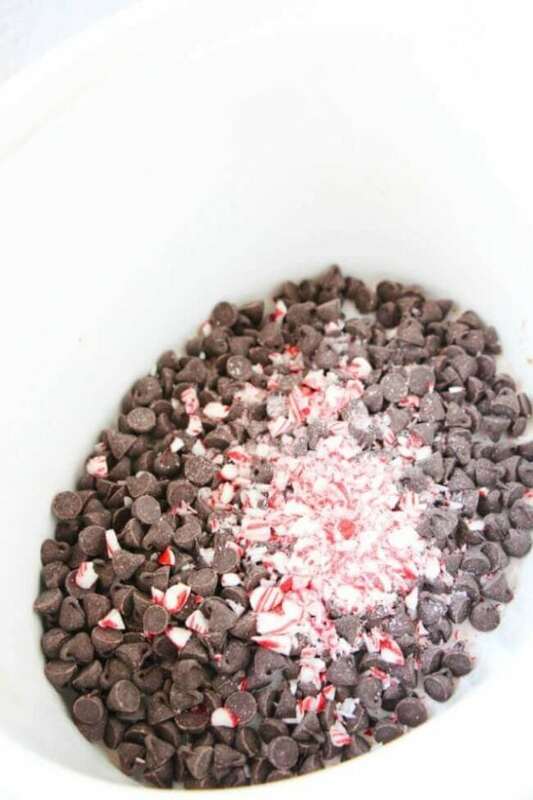 This recipe for crockpot peppermint hot chocolate is especially great for a party because you can make it in a slow cooker and get on with the next item on your to-do list. You could also offer some fun toppings for guests to sprinkle on, which is always fun. 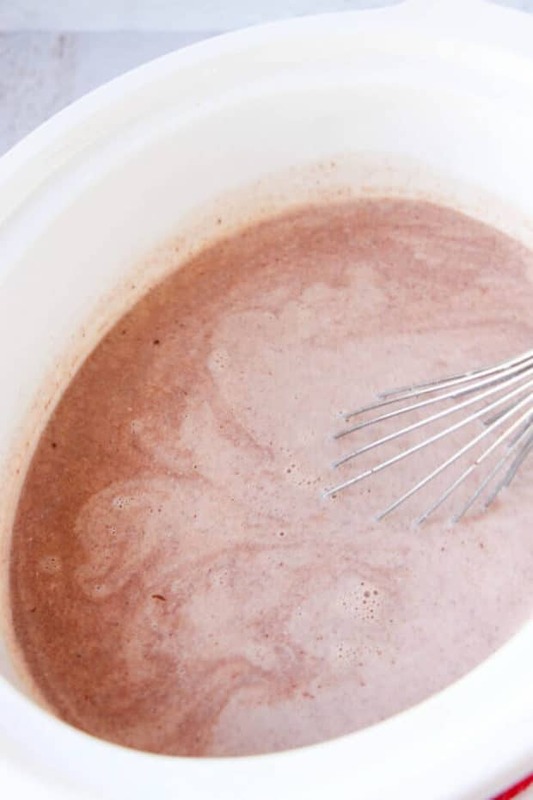 For this divine crockpot hot chocolate recipe, we’ll be using chocolate chips, crushed candy cane bits, vanilla extract, milk and whipped cream. I know some folks also add a dash of cocoa powder or white chocolate to their slow cooker. I like this recipe as is though! This makes a large batch, but you can definitely double — or triple 😉 — if you need more for lots of guests! 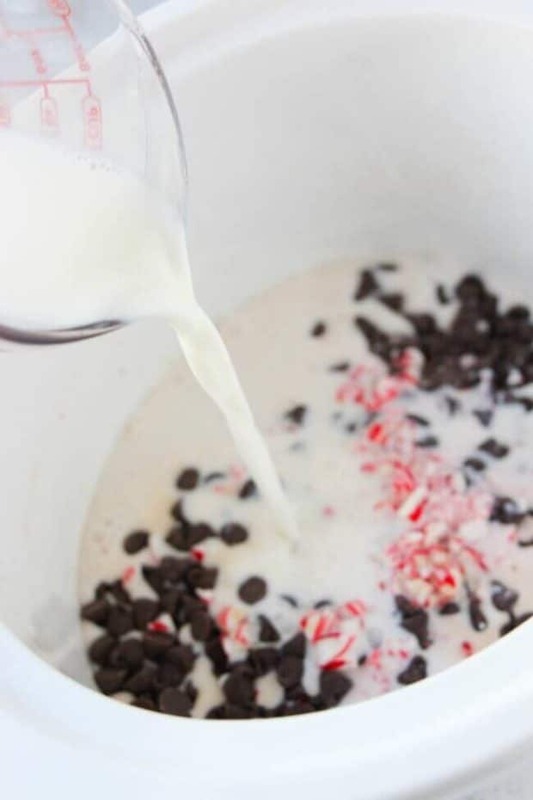 Place chocolate chips, crushed candy canes, vanilla and milk in a slow cooker. Heat on high for 45 minutes, or low for 1.5 hours. Whisk well and serve garnished with whipped cream and additional candy canes for garnish. I like allowing guests to add or subtract all the whipped cream and candy canes they want. Sounds like a holiday party to me! I hope your gang enjoys this delicious holiday treat as much as we do. 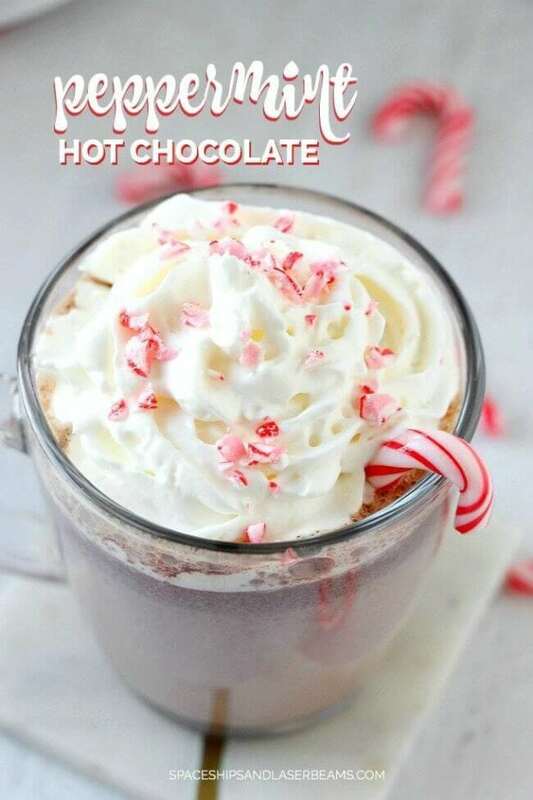 This crockpot hot chocolate with peppermint is the best. Enjoy! AND if you love this flavor combo as much as I do, you’ll also love these Peppermint Mocha Macarons! Whisk well and serve garnished with whipped cream and additional candy canes. One of my favorite recipes for Christmas time!